time flies as the BRC counters are approaching the end of the 2011 BRC edition. As you could read in previous updates the project has been a success. Monitoring went smoothly, not in the least thanks to our great team of coordinators whilst our student groups were highly motivated and interested to learn. Since the last update from half September both the monitoring and student exchange have maintained this high standard. Counts were held successfully and completely, also during rainy days, as in 2010 when the new BRC protocol was started. These data will allow us to do very important and interesting analysis regarding the effects of weather on local migration dynamics. Important knowledge that will be crucial in the context of long-term monitoring. As the migration enthusiasts among you will expect, since half September the migration has changed dramatically in species composition. 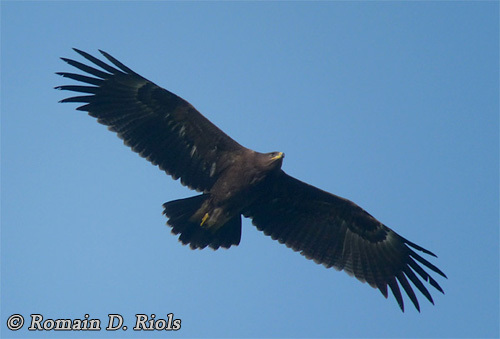 The eagle migration ‘exploded’ after a period of very bad weather on Sept 27th and the two following days when over 2000 Lesser Spotted Eagles accompanied by hundreds of Short-toed Eagles, Booted Eagles and dozens of Steppe, Greater Spotted and even several Imperial Eagles. A next peak came around October 4th with another several hundreds of Eagles. 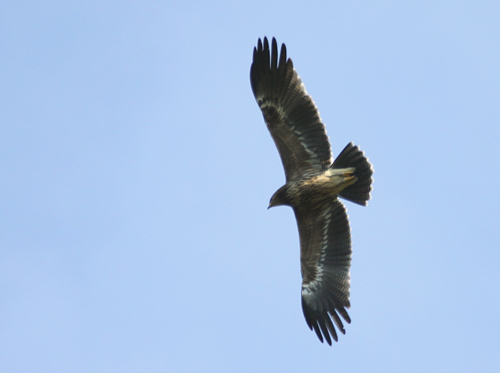 On top of the monitoring of priority species, many nice observations were made of rare birds, including Griffon Vultures, many Egyptian Vultures and Ospreys compared to previous years (a result of the new protocol? 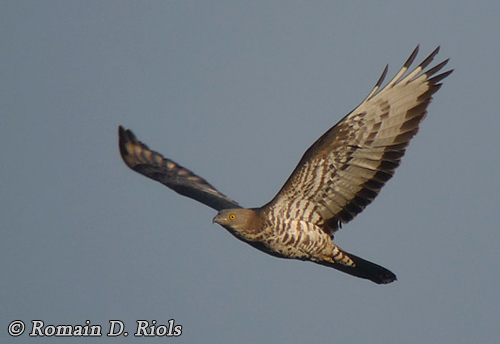 ), another Oriental Honey-buzzard … and even a new species for the Batumi Raptor Count: an immature Eleonora’s Falcon. This is the 35th diurnal raptor species encountered at the site over the past 4 years. Like you are all aware, during the counts several other activities aimed at community-based conservation are held at the site. In the weeks since our last update, two such projects should be highlighted here. Firstly, the education of local people. This is a topic that will receive much attention from 2012 onwards, though some important pilot projects were conducted in 2011 that provide BRC (and Georgian partner GCCW) with crucial information for designing education tools. This year, one particular education effort included a cross-over with our international summer course for students. Educators from Armenia who joined BRC to learn about conservation-in-practice gave presentations to school children in the village of Sakhalvasho. A good introduction for the children about why those strange people come to count bird every year. But also an important chance for us to learn how we can captivate these children to protect raptors in the future, rather then to shoot them. Secondly, local capacity-building for ecotourism. By promoting sustainable use/ecotourism as a viable economical strategy, BRC aims to increase the local support for conservation of raptors. 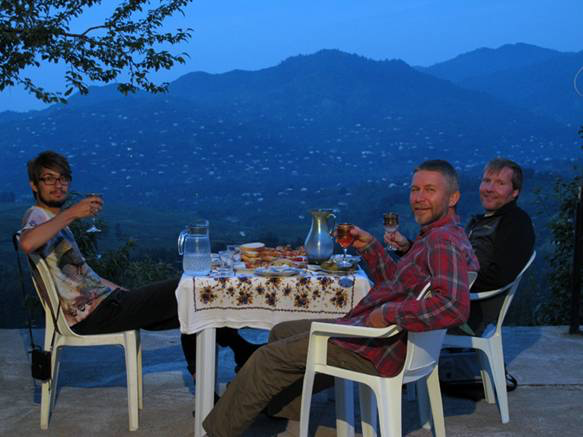 During the 2011 count several groups of tourists from all over Europe were hosted in BRC homestays: staying in the house of local families. We are happy to report this initiative is really catching on in the local community, and that in 2012 we will have the capacity to welcome several dozens of tourists in the area during the autumn migration season. This is a great step forward as the ecotourist sector can become a substantial part of the local economy, creating work opportunities for many unemployed people in the area. Interested to visit BRC as an ecotourist in coming years? Keep on eye on our webpage for more information! We also wish to report that the field work by BRC-team member Johannes Jansen for his Msc. Thesis dissertation on hunting pressure in the area was conducted successfully, and that photographer Bert Willaert has managed to collect an impressive series of images on the hunting topic. The work of both will be important pillars to promote the active protection of raptors in Georgia at the political and scientific level. You may expect a final update/report on the project towards the end of October. Right now, it seems like a good time to express our gratitude once more to everybody who is making BRC possible this year: our volunteers, coordinators, students and collaborators, partners and sponsors. Thank you!